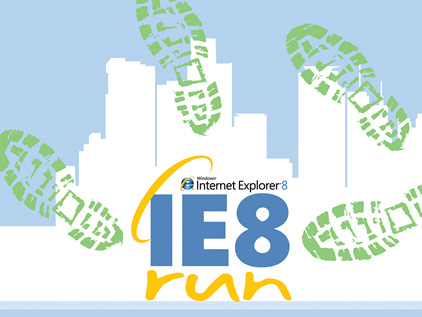 I participated in the IE8 Run yesterday, organized by Microsoft Philippines for the benefit of the UNICEF Child Protection Program, despite traces of coughing for the past couple of days. It was well attended by more than 1300++ runners. Despite the rain just hours prior, the whole race was blessed with a nice weather, with a few occassions of neglible drizzling. Runners had a choice of running in either 8, 4 or 2-mile routes. My official time for the 4-mile run is 59:53 which maybe a bad record but I'm not ashamed of it. First, it's been years since I've done something like this and I did no warm-up to prepare for the run. Throughout the almost an hour of what actually is more of brisk-walking together with officemates Ralph and Unyx, we were just telling stories and not really competing. In fact, we're just having fun out of the event! Sobrang payat mo na Jas a.... Hehe.. peace! Ang kulit nung pix ng kasama mo. wow I could never achieve that!!! wow jasper. i never tried any of those fun run. i should try it for a cause. No matter your place after finishing the run, what's more important is that you did it for a great cause. As I've been telling others, you are still a big winner. Congratulations for the time 59:53, and of course for reaching the finish line... (4 miles ain't that bad)! nice one. the last time i did that was ages ago and i must say i had better time before. but if u ask me to run now, i'll definitely eat ur dust lol.